Slowly add water in a small amount of calcium oxide or quick lime containing in a conical flask. Touch the beaker. Do you feel any change in temperature ? Objective – Combination reaction with heat change. 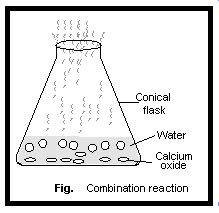 Inference – Calcium oxide (CaO) reacts vigorously with water and form a single product, calcium hydroxide (slaked lime). This reaction is an example of combination reaction which liberates a large amount of heat (exothermic reaction). So, when the beaker is touched from outside, it feels hot. Conclusion – In combination reactions, two or more reactants combine to form a single product.